We can help you protect your hard work and valuable files. A UPS (Uninterrupted Power Supply) can protect you against power surges and outages in a way that no little surge protector can. 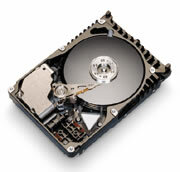 A backup system is critical to preventing data loss. We can analyze your needs and recommend and implement a system backup to keep your data safe and recoverable in case of a disaster. Firewalls protect you from destructive intrusion and spying by hackers. We have both hardware and software based Firewalls, depending on your needs. Call or e-mail us if you're ready to take the next step in protecting your data.